This article is about the device that intentionally causes a vehicle to derail. For the act of derailing itself, see derailment. A derail or derailer is a device used to prevent fouling (blocking or compromising) of a rail track (or collision with anything present on the track, such as a person, a train or a fallen branch) by unauthorized movements of trains or unattended rolling stock. The device works by derailing the equipment as it rolls over or through it. Although accidental derailment is damaging to equipment and track, and requires considerable time and expense to remedy, derails are used in situations where there is a risk of greater damage to equipment, injury or death if equipment is allowed to proceed past the derail point. approaching a drawbridge, dead end, or similar hazard. There are four basic forms of derail. The most common form is a wedge-shaped piece of steel which fits over the top of the rail. If a car or locomotive attempts to roll over it, the wheel flange is lifted over the rail to the outside, derailing it. When not in use, the derail folds away, leaving the rail unobstructed. It can be manually or remotely operated; in the former case it will have a lock applied to prevent it from being moved by unauthorized personnel. This type is common on North American railroads. Derail on Nemuro Main Line, JR Hokkaido. It is set so that a train proceeding away from the camera will remain on the track. The second type of derail is the "split rail" type. 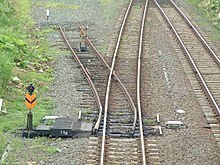 These are basically a complete or partial railroad switch which directs the errant rolling stock away from the main line. This form is common throughout the UK, where it is called trap points or catch points. The third type of derail is the portable derail, and is used by railroad mechanical forces, as well as some industries. This is often used in conjunction with Blue Flag rules and is temporary in nature. They are placed onto one side of the rail with the derail pointed to the outside of the track. Then there is a part of the derail that is able to be tightened down to the rail and then secured with a locking mechanism. If the derail is left unlocked for any reason or does not have a locking mechanism deployed then the owner of the derail can face substantial fines if found by an FRA inspector. The fourth type of derailer is the powered or motorized derailer, electronically powered through an actuator. This type of derailer can be controlled remotely from an external control panel or manually. It is commonly installed as a part of Depot Personnel Protection Systems, to ensure personnel safety in maintenance workshops and depots. Derails have failed on occasion, such as on April 1, 1987, at Burnham, Illinois, when an unsecured car in a siding defeated a derail and fouled the mainline. Due to rusty rails, the car then failed to shunt the track circuit that should have put block signals to "stop". On April 20, 2017, three workers were killed in an accident on the Englewood Railway in Woss, British Columbia when 11 runaway railcars full of logs crashed into them and their equipment while they were working on the line. The railcars had become decoupled at the top of the hill and as they rolled out-of-control down the hill they overpowered the derails which had been installed incorrectly and into rotting rail ties. Wikimedia Commons has media related to Derail. ^ Kellenberger 1919, p. 208. ^ a b Kellenberger 1919, p. 203. ^ a b Adams & Hitt 1912, pp. 195–197. ^ Meyer, J. Joe (March 9, 1978). "Portable derail". US Patent & Trademark Office. Retrieved September 25, 2006. ^ a b Kellenberger 1919, p. 206. ^ Hayes Track Appliance Co. (1921). "Derails". In Howson, E.T. ; Lewis, E.R. ; Kellenberger, K.E. (eds.). Maintenance of Way Cyclopedia. New York: Simmons-Boardman Publishing Co. p. 704 – via Google Books. ^ Hayes, Stanley W. (August 7, 1917). "Patent 1,235,971, Derail". Official Gazette of the United States Patent Office. Vol. CCXLI. Washington, D.C.: Government Printing Office. p. 145 – via Google Books. ^ "Faulty coupling, rotted ties led to deadly train derailment in Woss, B.C. : report". CBC News. CBC News. Adams, Braman B.; Hitt, Rodney (1912) . Railway Signal Dictionary. New York: Simmons-Boardman Publishing Co. – via google Books. Kellenberger, K.E., ed. (June 1919). "Use of Derails Varies Greatly on Railroads". Railway Signal Engineer. New York: Simmons-Boardman Publishing Co. 12 (6): 203–209 – via Google Books. Office of the Federal Register, National Archives and Records Administration (October 1, 2002). Code of Federal Regulations: Transportation. Washington, D.C.: Government Printing Office – via Google Books. This page was last edited on 10 March 2019, at 12:01 (UTC).